An antique tent of the Roman military camps. The Roman armies camped out in tents which were made of leather. There were two types of the tent. They guess that the smaller ones were used as tents for the men. The bigger tents, which were called Centurion tents, had high side walls because of the headroom. They were used as accomodations for officers and the centurion. The parts of military tents, which were found in Vindolanda and Valkenburg, made reconstructions possible. 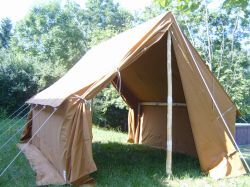 The original tents were made from approx. 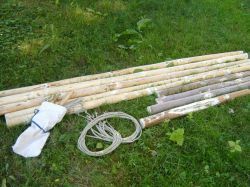 more than 70 goat skins predominantly but also from calf or cow skins. 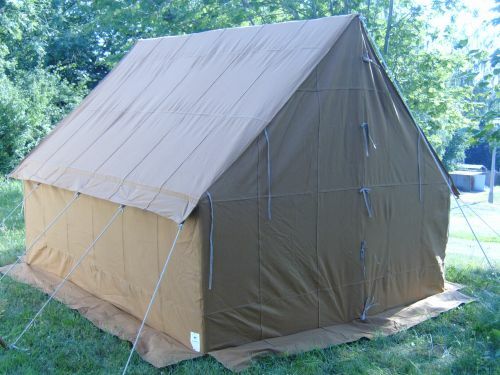 This Roman tents manufactured by us consists of brown fabric parts from all cotton. They have dimensions of 50 * 70 cm/ 19.7in * 27.55in. The authentic replica made in this way would be affordable for you. Our tent is accessible from both gables and has an outer weatherstrip/ mud flap. We provide the tent in the standard size from Height 2,20 m/ 7.2ft/ 7,33 RF*, Width 2,60 m/8.5ft/ 8,67 RF, Length 2,90 m/ 9.5ft/ 9,67 RF and wall height 1,00 m/ 3.28ft/ 3,33 RF an. Of course we also regard your own ideas. The pole set is made from natural finish wood and consists of 4 corner poles, 2 gable poles and 3 lay-on poles (1 ridge pole, 2 wall poles).